The key, however, is to increase heat capacity and reduce compliance without upsetting a vehicles stock front-to-rear brake torque ratio. 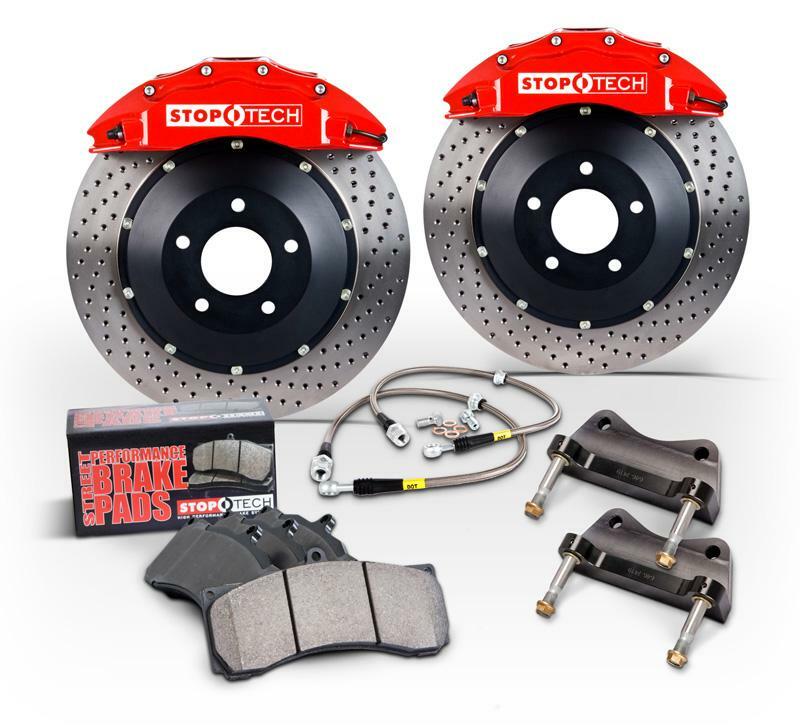 That is why StopTech developed the Balanced Brake Upgrade design philosophy, which precisely apportions front and rear braking resources while factoring in vehicle weight transfer under braking. In contrast, a brake upgrade that adds too much front torque (as many do), will reduce your cars ability to maximize the traction available from all four tires, robbing you of performance. In addition, a system that uses too many pistons or pistons that are too large will make the brake pedal much more difficult to modulate, limiting a drivers control of brake input. StopTech 2-piece calipers have the lowest amount of flex and deflection among 25 of the leading caliper models (including some monoblocks) from well-known manufacturers. This is accomplished using StopTechs patented bolt-in bridge, which is strong enough to stop distortion without sacrificing cooling through the top of the caliper. The standard StopTech caliper finish is a glossy high temperature paint available in one of six different colors red, black, silver, blue, yellow and gold. Trophy Sport and Trophy Race Big Brake Kits use weight-optimized STR calipers finished with a deep natural anodized coating that resists fading and discoloration at extreme temperatures. Braided stainless steel lines reduce system compliance and improve brake pedal feel and modulation. StopTechs Stainless Steel Brake Lines are D.O.T. compliant and designed to fit your vehicle. My purchase with autoplicity was a good one. I received my yellow top battery in great condition. It was priced, and packed well. Received it in just a few days with a full charge,easy install. I would guy from this merchant again. Easy to use website. The belts I ordered didn't have a picture but I knwew what I was looking for.